Making My 3rd Doctor Costume: ANOTHER amazing 3rd Doctor item on eBay!! 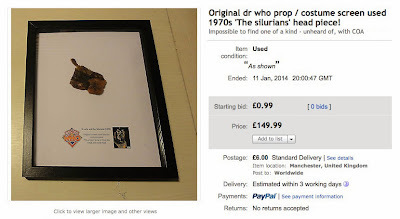 Only yesterday I showed you a RARE original Silurian head on eBay. Well, it ends up there are apparently TWO such original Silurian heads. I cannot vouch for their authenticity, but they do look good. Almost too good. AND ITS STILL IN GOOD CONDITION, LOOKS GREAT ON DISPLAY JUST HOW IT WAS IN THE EXHIBITON. THIS IS A VERY RARE ITEM TO COME BY! PLEASE CONTACT ME FOR ANY OTHER QUESTIONS. I SHALL SEND WORLD WIDE AND IT SHALL BE DISPATCHED WITH UPS DELIVERY SIGNED AND TRACKED UK NEXT DAY DELIVERY! IF YOU ARE OVER SEAS PLEASE CONTACT ME FOR A SHIPPING QUOTE. 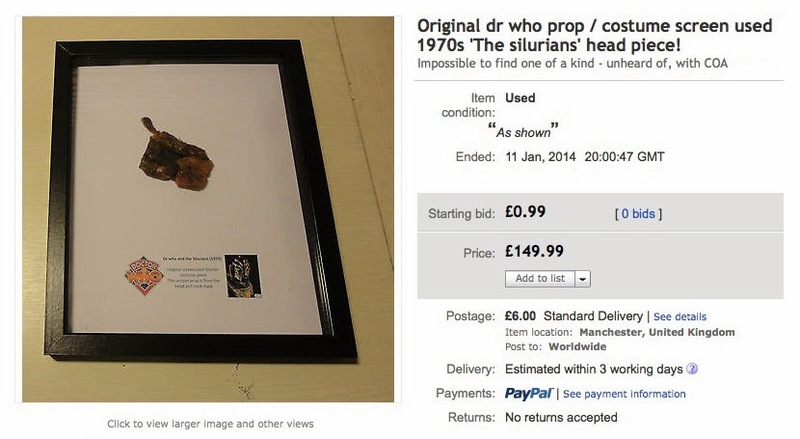 Looks like one of the two heads sold on eBay has either been cut into pieces or bits are dropping off them! 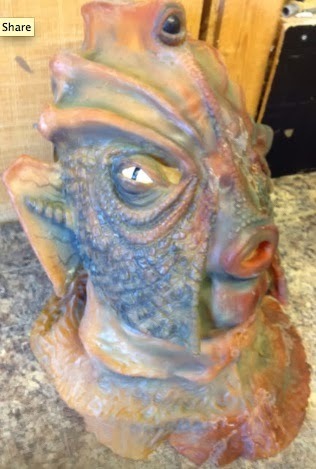 This is an amazing piece - with the anniversary of doctor who, I thought I would offer this absolutely last amazing opportunity from my own personal collection. 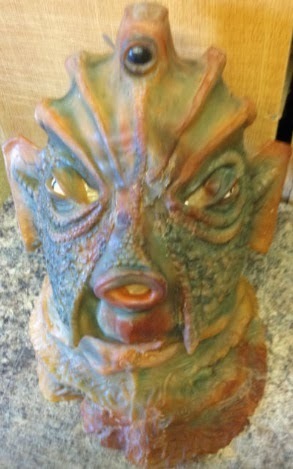 This is a fantastic original prop with fantastic provenance. 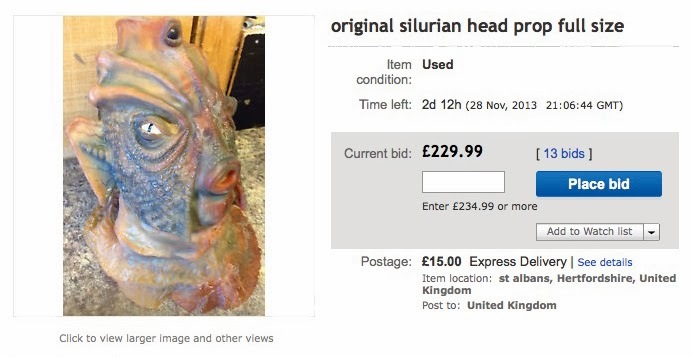 There is only one original 1970 Silurian costume left in existence. When it was being restored, a few small original pieces had to be discarded. 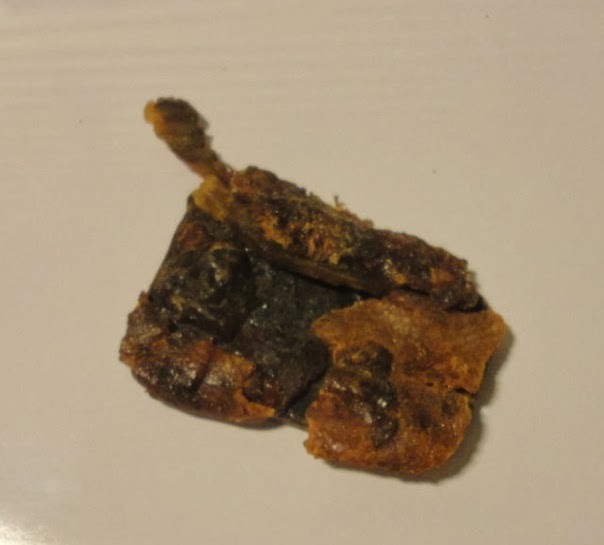 This item is from the head and so rare it is unthinkable - I did not intend to sell this, as it is my own I was going to keep, but pressures have forced my hand! I have only sold two other smaller pieces two years ago and both went for £150. This comes displayed in a display frame and will be supplied with certifcate of provenence confirming its authenticity.